One of the biggest challenges facing India’s democracy is the growing role of money in elections. During the 2014 parliamentary elections politicians jointly spent an estimated 5 billion dollars. As the spending increases every election, this amount will likely be even surpassed in the upcoming 2019 elections. These extravagant campaign costs are worrisome, for a range of reasons. High campaign expenses foster corruption, threaten the quality of governance and undermine the fairness of the electoral process. Rich candidates or candidates with wealthy backers are at an advantage while poor but capable candidates are discouraged from even running for elections. These campaign costs also foster collusive deal-making between politicians and business actors, who expect to be compensated for their campaign contributions with licenses, contracts and other favours. As a result, discontent and worries about the high costs of elections are animating regular newspaper commentaries, as well as a number of recent policy initiatives from Modi’s government. In that light, it was high time that scholars of Indian politics pay more sustained attention to political finance. In bringing together a varied and insightful set of essays in a highly readable edited volume, Devesh Kapur and Milan Vaishnav have done a great service to both scholars of Indian politics as well as New Delhi’s policymakers. 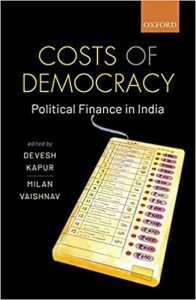 By bringing together a group of experienced and knowledgeable scholars employing a refreshing mix of research methods, Costs of Democracy succeeds in providing a comprehensive overview of the policies, character and effects of political finance in India. Through a combination of thorough on-the-ground ethnographic accounts, clear-headed policy analyses as well as overview studies based on surveys, election data and even cement consumption statistics, the book discusses not only the various ways in which politicians put money to use during elections, but also the ways in which policy-making could address the resulting threats to India’s democracy. The resulting picture is both fascinating and gloomy. The fascinating part concerns the creative strategizing that surrounds the use of money in Indian elections. Money, as the articles in this book show, shapes politics in stunningly wide-ranging ways. Neelanjan Sircar discusses the role of money in candidate selection, highlighting that political parties—out of concern for meeting campaign expenses—are inclined to select wealthy candidates. Other essays highlight the kinds of collusive deal making that campaign financing generates—from exchanges between builders and politicians—the focus of Devesh Kapur and Milan Vaishnav’s essay—to the flows of money between politicians and various kinds of brokers and ‘social workers’ (Björkman and Witsoe’s piece). Particularly fascinating is also Collins’s account of how the need for campaign finance forces a poor political party in Tamil Nadu (the VCK) into a dependent relationship with a richer political party (the AIADMK). This party pays for VCK’s campaign costs in exchange for political subservience. Similarly, fascinating are the accounts of the various ways in which money is used. Simon Chauchard uses his ethnographic fieldwork to provide a particularly rich overview, providing at one point a list of forty different types of expenditures, ranging from using money to put up dummy candidates, to hiring trucks to ferry voters, giving money to journalists to ensure favourable reporting, to ‘work money’—i.e. the wages paid to campaign organizers. Considerable attention is paid to vote buying, i.e. the practice of handing out money and consumer goods during election campaigns. Several authors conclude that this practice is increasingly common, and contributing greatly to the overall costs of election campaigns. Particularly Björkman and Witsoe make the point that this practice should not be seen as simple marketplace-like purchase of the vote. The picture that emerges from this book is that vote buying is a complex (and expensive) form of political advertisement. The gifts of money to voters not only serve to convey the candidates’ concern and care for individual voters, but the distribution of these gifts also play an important role in building social networks, and signalling their strength: the distribution of money through a local broker shows voters that this broker has a close and therefore useful connection to the candidate. Because of these and other observations, this book makes for highly recommended reading for people wanting to understand the nature of election campaigns in India. The book makes a convincing case that the costs of elections in India have spiralled out of control, with considerable negative effects for both the functioning of government institutions as well as the quality of India’s democracy. This is apparent, for example, in Jennifer Bussell’s insightful essay. She surveyed local politicians about (their perception of) the provenance of their own campaign budgets as well as that of their rivals. Unsurprisingly, politicians consider their own budgets to be relatively clear while providing damning and worrying assessments of the political finance of their rivals: Bussell’s survey suggest that ‘black money’—i.e. illegal, often criminal funding sources—is considered to be the most common source of campaign finance in parliamentary elections. Bussell’s essay, as well as Collins’s and Sircar’s articles show that high campaign costs make it easy for well-endowed actors to influence the political process, while limiting the power of marginalized groups. The main take-away of this book is, therefore, in order to improve the quality of democracy (in India as well as elsewhere) more extensive efforts are needed to control the role of money in elections. Keeping this in mind, it is fitting that the book also pays considerable attention to the policies regarding political finance. As the overview piece by Sridharan and Vaishnav shows, policies to regulate political finance are in place. But they are generally flouted as spending caps are unrealistically low and India’s Election Commission lacks the manpower to effectively monitor campaigns or to check on the financial reports that politicians submit after their campaigns. Kapur, Sridharan and Vaishnav end the book with a set of policy recommendations that might serve to address such problems, and reduce the role of money in elections. They recommend measures to improve transparency in campaign financing, and a bigger role of public financing, coupled with incentives for small individual campaign donations. While having their own challenges, these recommendations make sense. The prominence of money in elections is not an unavoidable, natural phenomenon, it is something that can and should be brought under (some levels of) control. The book is unlikely to be the final word on political finance in India. As the editors point out, in this relatively young academic debate much remains unknown. For example, even between the authors of the book debates rage about whether candidates rely mostly on their own personal finances (Sircar’s position) or on outside contributions (Bussell’s argument). Similarly, this book could not touch on whether and to what extent there is variation in money politics and vote buying across Indian States. Thirdly, the book does not really get into the broader effects of high-cost elections on policymaking and governance. To what extent the political importance of money is enabling economic elites to bend the Indian state to its will? What do campaign donors ask and receive in return for their financial contributions? Having studied politics in Southeast Asia where ‘oligarchic politics’ is a more prominent trope of analysis, we would expect that such questions will become even more urgent in the coming years. In that light, we can only hope that other researchers will take up the torch that the authors of this edited volume have lit. Ward Berenschot is a political scientist and a researcher at Leiden University. Sarthak Bagchi is Assistant Professor, School of Arts and Sciences, Ahmadabad University, Ahmedabad.